Four poster beds are the most classic and striking statement pieces you can get for your home. If you want to make your bedroom feel like a luxurious retreat, begin with a four poster bed that has an eye-catching timeless look. From here, the options are endless when it comes to customizing your bed according to the look you are going for. Elegant and ethereal finishes particularly suit such beds, with canopies being the most popular way to add a personal touch. Canopies and four poster beds go hand in hand. There’s nothing like a canopy to provide a touch of luxury and royalty to your bed — creating a private retreat for you to enjoy every night. Try one of the following ideas to match your four poster bed to your exact personal tastes, whether that be a bohemian bedroom or a regal one. Adding fairy lights or string lights around the bed frame will completely transform your room at night — creating a whimsical scene right out of a Disney movie. This can be done in a number of ways, such as attaching the fairy lights to a fabric canopy, adding them to the headboard, or even creating an entire canopy out of dangling fairy lights. If you want to replicate the look of a romantic fairy tale, fairy lights are by far the best way to do so! If you would rather have a down-to-earth look than an up-in-the-clouds one, drape a bohemian tapestry over your four poster bed or as a backdrop to your bed. This will instantly create a relaxing environment, turning your bedroom into your own personal retreat. Bold colors in the form of a mandala is a particularly striking and popular iteration of this style. 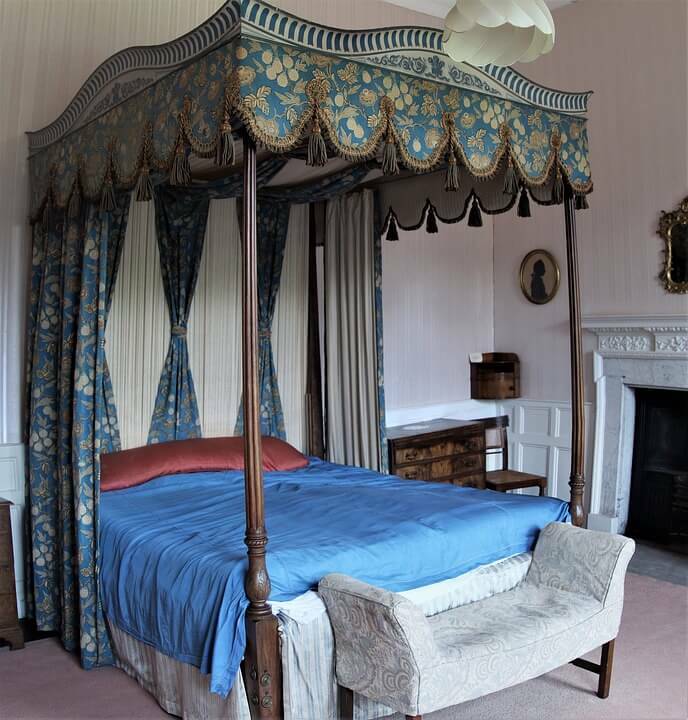 The original purpose of having canopies around four poster beds was to allow for privacy and to retain heat. If this is what you’re wanting to get out of your bed as well, install a thick curtain as your canopy. This will prevent you from waking up at the crack of dawn, keep your bed nice and toasty, and allow for an extra layer of privacy — which is particularly great if you are placing it in your guest room. TIP: Planning to Remodel Your Bedroom? Use our free Bedroom Remodeling Calculator to Find Out the Remodeling Cost Instantly. Perhaps the most popular style of a canopy is the good old-fashioned mosquito net. Although it serves a very practical purpose of protecting you from mosquitos, the net also creates a light and ethereal look. The material is particularly beautiful when natural daylight shines through it, or nearby lights create a glow through the material. Thin linen gives much the same visual effect, although it won’t protect from mosquitos. For the more artistically inclined, creating a canopy out of fake flowers is a stunning DIY project to take on. 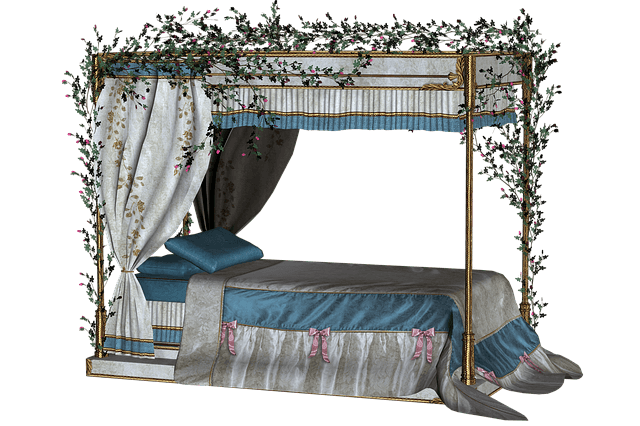 This style of canopy serves a more aesthetic purpose than practical, with it being more doable to string the fake flowers along the posts of the bed rather than trying to create an all-encompassing canopy purely out of fake flowers. Feeling like a princess has never been so easy: just get crafty with fake flowers from your local dollar store! If adding a canopy around the entire bed seems too difficult, try creating your own hoop canopy. This easy DIY creates a beautiful halo-like effect over the bed, which becomes twice as beautiful with the addition of fairy lights. This look can easily be created by attaching fabric to an embroidery hoop or even a hula hoop. See a DIY tutorial here. Want to live like a queen? Like, literally? Get a bed with heavy Victorian tones. Here, notice how the ornate silk canopy, with golden tassels, complements the intricately carved antique four poster bed. The sheet too is silk — for that supreme royal feel. 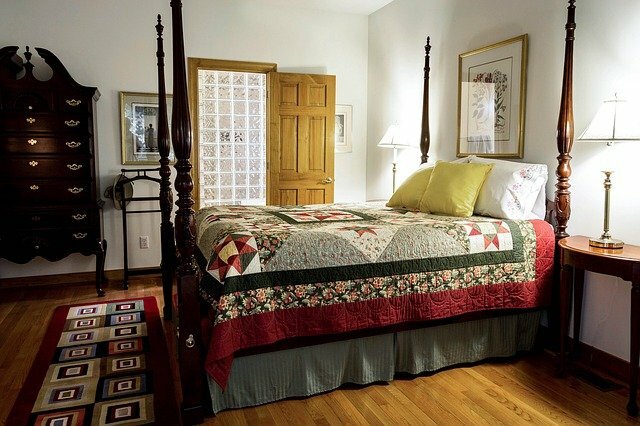 Such a bed easily becomes the focal point of the room. The rest of the room decor is kept simple but aligned with the theme. Instead of going for thick materials, try creating an extremely dreamy and airy look with lightweight, slightly distressed fabrics. This barely-there look is great for creating an ethereal getaway, and also doesn’t block much natural light if you enjoy waking up with the sun. This idea is similar to the bohemian tapestry but is more eclectic. Try using sheer Middle Eastern or South Asian fabrics to replicate the colors and patterns of a lively bazaar. This look manages to be vibrant yet soothing at the same time, creating a magical retreat for you to enjoy every night. Adding some embroidered or sequined pillows will take this look to the next level. Of course, high-quality four poster beds are already designed in a timeless and elegant way. This means that if you’ve bought a beautiful designer poster bed from a reputable furniture-maker, you could leave it completely unadorned and still have it be a striking statement piece in your bedroom! Four poster beds have long remained one of the most popular bed choices, particularly for those wanting to invest in a true one-of-a-kind piece of furniture. Canopies can take such a bed to the next level, and provide ample opportunity for you to add your personal touch to your room — especially with one of the above DIY solutions. Justin Jersey is a journalist, stylist, and blogger. He is an aesthetician by heart who often writes about Art, Fashion, decorating and DIY ideas. He loves sparking creativity and giving them ideas for their own spaces.